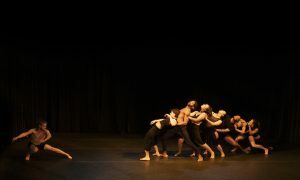 ELSCO Dance's 'Close'. Photo by Mikey West. The Huntington Avenue Theatre, Boston, Massachusetts. The duet form can make art speak to one of the most innately human experiences: two people interacting in time and space. Boston Contemporary Dance Festival, hosted by Urbanity Dance, had many noteworthy works of varying numbers of dancers in its 8pm show. Most striking, however, were the sheer number and stylistic variety of duets. This was compelling and refreshing to see, considering overall trends in contemporary dance. 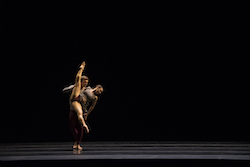 Third in the night’s lineup was Robert Mark Dance’s interwoven shadow, choreographed by Robert Mark Burke, a contemporary ballet duet striking in both its technical daring and atmospheric ferocity. Dancer Monica Gonzalez began posed, spotlit center stage, reaching up aspirationally. A score of classical choir singing began, bringing a sense of a higher power’s presence. She began to move with command, yet with an air of agitation. Robert Mark Dance in ‘interwoven shadow’. Photo by Mikey West. Lights soon rose, and her partner, Jared McAboy, joined. Lights angled such that the dancers created shadows as they danced – hence, the title interwoven shadow. Red and gold costumes added to the intensity of movement, music and lighting. They danced together in a magnetic relationship – sometimes uncontrollably drawn to each other, other times repelled. There were moments of seeming submission, such as Gonzalez melting into McAboy or moving in far lower space. Then she would rise higher, or move away from him. Inventive phrasework, initiated by joint articulations, matched striking musical dynamics. There was a Balanchine flavor of intentional assymetry for dramatic effect and increased virtuosity. A striking phrase was a fouttée turn into a leap that went all the way to the floor (through a plank). 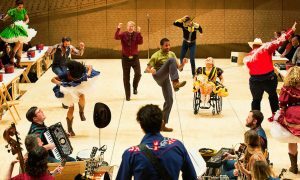 Mark Burke wasn’t holding anything back, and neither did his dancers. To end, Gonzalez danced below McAboy, in seeming submission, for a good deal of time. In a “#metoo”, “#timesup” age, this felt a bit socially tone-deaf. 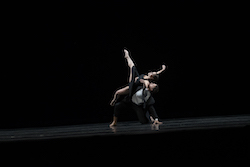 Yet, thankfully, McAboy exited and Gonzalez rose to end the piece as she began – posed in a spotlight center stage. This choice created a powerful “full-circle” structure. Before intermission came Cheek to Cheek, choreographed by Jaclyn Walsh in collaboration with Brandon Koepsell. It was a contemporary dance twist on smooth, classic soft shoe. The work somehow simultaneously embodied suave and devil-may-care quirkiness. Fred Astaire’s version of the song rang out, with a bit of that classic record feedback in the audio – atmospheric, rather than pesky. Dancers Walsh and Koepsell executed classic soft shoe footwork with contemporary touches, including flexed feet, inversions and inventive lifts. At one moment, for instance, Koepsell flipped Walsh to face him as she took a backbend. After some delicate footwork, he lifted her, to then have her spin around his back horizontally. Somehow, such stylistic shifts didn’t feel jarring but were instead silky smooth. Jaclyn Walsh and Brandon Koepsell’s ‘Cheek to Cheek’. Photo by Mikey West. Costumes were in 1950s style dress-casual – a puffy blue polka-dotted dress for Walsh, and slacks with a collared shirt for Koepsell. These seemed to frame and match their movement wonderfully. Energy and precision of line superseded height of extensions. Cleanliness of line in use of stage space, as they lilted in turns and steps all around the stage, was just as precise – precise, without feeling stilted or overly formal. It all felt as natural as breathing. I felt as if I was breathing along with the pair, with that ease I was viewing. There was no overt romanticism, but the dancers’ close connection as humans who cared for – and understood each other – was clear. As they ended the piece and the lights went down, the audience erupted with raucous applause. Well deserved, I was thinking. Right after intermission was ELSCO Dance’s Close, choreographed by Jeffrey Gugliotti and Ellenore Scott and danced by Gugliotti and Amelia Lowe. It brought a clear tonal shift from the prior piece. Lightning (from Chris Fournier) created twilight tones, and costumes were black. Similarly to interwoven shadow, yet with movement quite stylistically different, shadows brought visual intrigue. Facings, simple (yet clear) footwork, and levels in space – rather than virtuosity – brought intrigue. In partnering, straightening and bending knees created shape and nuance. 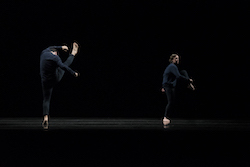 A compelling section with one dancer facing forwards, and the other backwards. I could feel clear energetic lines in space. This facing-front, facing-back theme re-emerged here and there, such as with Lowe falling forward (but toward upstage) into Gugliotti (facing downstage). She then rose to end up facing forward, turning in space by her own and Gugliotti’s propulsion. A sense of supporting each other, yet moving forward on their own path, was clear. This theme carried through until the end – the two standing spotlit centerstage, embracing but also reaching upward. The image, and its meaning, were truly resonant. Hollis Bartlett and Natalie Trogdon’s ‘transmuting’. Photo by Mikey West. Second to last in the night was transmuting, choreographed and performed by Hollis Bartlett and Natalie Trogdon. Particularly intriguing about this work, as a duet, was their unity without making contact (eye or physical) or even coming all that close together in space. The work was also quite aesthetically pleasing, in the truest and simplest sense, without any tricks or flashiness. The only score was their breath and the sounds of their feet across the stage. Costumes were a clean, uniform blue-gray. Lighting was blue grey, with a tinge of yellow for brightness, to match. The pair began the work with unison footwork patterns, the rhythms of their stepping in perfect sync. One leg would sweep behind, to cut the other leg out and have it fall forward – pause and lilt from inevitable physical laws helping to create rhythm. 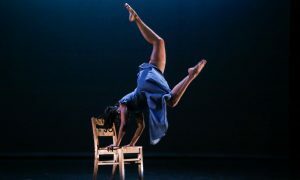 It made me remember something about contemporary dance that truly fascinates and pleases me – its frequent investigation of how to use the laws of physics to one’s advantage, rather than a goal of defying them. A bit later, shaking and vocalizations set in a place a pleasing stylistic shift. Something about it was incredibly funny, and audience members chuckled. In another section, they brought another shift through a long pause. Then came shorter pauses after phrasework – while they faced upstage, slowly unwinding torsos to face back downstage. Repetition of this clear structure, along with repetition and clarity throughout the work, felt meditative. The piece demonstrated how there are incalculable ways to dance together as a pair – it only takes imagination and daring. 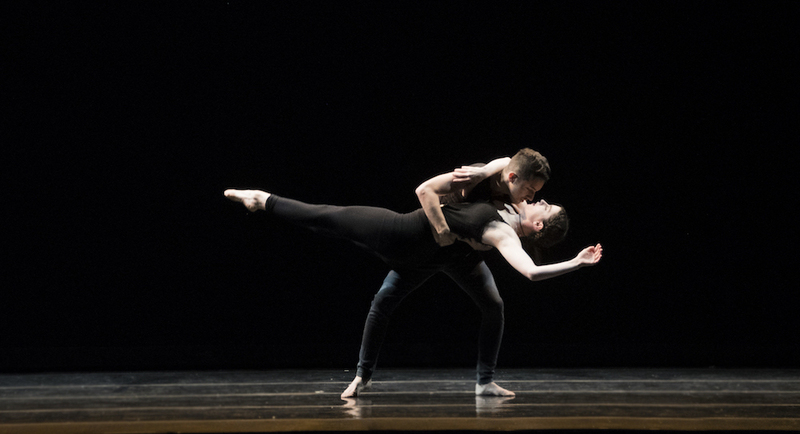 With several imaginative, daring duets in the performance, Boston Contemporary Dance Festival’s evening show proved that loud and clear.